Less satisfactory than the descriptive analyses, however, are the explanations of how, in Dickinson’s own phrase, ‘animal art gained its place in early medieval affections’. Previous analyses have, in my view, tended to be constricted within an unsatisfactory and problematic conceptual matrix. This begs two crucial questions: ‘why then?’; ‘why like that’? We are entitled to ask why, if the term ‘Germanic’ can satisfactorily perform any analytical work, the ‘Germanic interpretation of the animal world’ in art only ‘begins’ in the late fifth century, when Germanic-speakers had dominated the region for centuries. Furthermore, why does this art take this particular form after (and indeed before) centuries within which the metalworkers of Germania Magna had proved more than capable of reproducing Roman models or otherwise producing coherent figures and interlace? Appeals to a pan-Germanic cultural ethos get us nowhere in response to either question. That the notion of pan-Germanic identity and ethos emerged in the precise, contingent circumstances of sixteenth- to (especially) nineteenth- and twentieth-century German politics is surely now well established. The idea that all speakers of a Germanic language can be treated as culturally interchangeable can no longer be sustained. Scandinavian origin myths among post-imperial peoples cannot be traced before the sixth century and, even then, among the Italian Goths alone, where it was clearly only one of a number of stories circulating. Alleged Scandinavian origins for other early medieval peoples (like the Lombards or Burgundians) emerge later, in emulation of the Goths. Yet, such appeals to ‘Germanic’ culture remain as common as ever. A swathe of recent work on Style I has attempted to read it in line with changes allegedly occurring in Scandinavia at this time which produced the Germanic concept of the hall. Another appeal to the pan-Germanic ethos is associated with the fairly widespread claim that Style I was a badge of a ‘shared Germanic aristocratic identity’. When applied to decorative art, this argument is circular. Style I’s popularity is explained because its ‘Germanic’ nature appealed to the ‘Germanic’ social élites who sponsored its production. For the irrefutable reasons previously outlined, ‘Germanic’ is a label that can carry no analytical, or even descriptive, weight, either for the art or the people. That a common élite identity existed amongst Germanic-speakers in the late fifth and sixth centuries finds no more support in any written data, such as exists for at least some of the regions this shared aristocratic culture allegedly encompassed. This explanation has no empirical grounding whatsoever. Therefore, the existence of a shared ‘Germanic’ élite ethos has to be argued in reverse, from the distribution and popularity of the art style. And so on... Furthermore, if ‘Germanic’ art only emerged in the later fifth century, in spite of the long-standing existence in Scandinavia of Germanic-speakers, then it would seem that, to be popular among a Germanic élite with a shared culture, that ‘shared Germanic culture’ could – logically – only have emerged at the same time, alongside the art. How this might be possible across a wide area of diverse, frequently antagonistic peoples is not an issue that appears to have troubled students of Style I who espouse this argument. If there were any area where a common, non-Roman, military identity might be employed to unify Germanic-speakers of diverse cultural, geographical and familial backgrounds, that area would not be Germania Magna but, ironically, the Roman Empire itself, where fifth-century politics were increasingly focused around military leaders of at least a claimed non-Roman origin. It may in fact be that material culture did come to be employed in precisely that way to unify exactly that disparate élite group but, if it did, it was material culture originating in the Mediterranean, not the Baltic. The other component of the problematic analytical matrix is religious. Style I imagery frequently continues to be read according to concepts drawn from Norse sources from (at the earliest and most optimistic) c.1000, half a millennium after the appearance of this form of decoration. These texts are then supplemented by (and indeed read via) anthropologically-derived ideas of shamanism and tribal ritual of uncertain application. It must never be forgotten that the principal sources upon which any view of Nordic paganism is based, the Prose and Poetic Eddas, were both written down in earlier thirteenth-century Christian contexts, the former by Snorri Sturlusson. The extent to which they represent earlier texts (written or oral), the faithfulness with which they do so, and how much earlier any such texts can be dated are all matters for guesswork, not fixed starting points for analysis. The ‘pagan’ axis of Style I interpretation nonetheless assumes that an image of pagan belief obtained from these texts can be applied, in detail, to artwork no less than 750 years earlier. However, between the late fifth and the late twelfth centuries artistic motifs changed dramatically in the Nordic world. Style I gave way to Style II, Style III, and then the array of Viking styles – Oseborg, Borre, Jelling, Mammen and Ringerike – before, with Urnes Style (in its early, middle and late forms of course), we arrive at the end of the Germanic/Viking Animal Art ‘era’. Even at Urnes Style’s demise we still have fifty years or so to wait before Snorri wrote down the Prose Edda. While Scandinavian decorative art between c.475 and c.1170 went through no fewer than nine changes (not counting Urnes Style’s subdivisions) of sufficient importance to necessitate a change of art-historical categorisation, the mentalité it represented is thus supposed somehow to have drifted along unchanged beneath this turbulent surface of actual, documented expression, eventually to be written down in effectively the same form as it had taken 750 years previously. The difference between the supposed stasis of Scandinavian pagan belief and the dynamism of its artistic expression is made yet more problematic by the paradigm itself, which sees the emergence of Style I animal art (surely correctly) as symptomatic of important social and cultural change. If that were the case then something similar surely lies behind the many subsequent changes of style. Scandinavian archaeology, reveals important, dynamic change in social and economic structures throughout the second half of the first millennium. Against this background, an entirely stable set of religious beliefs and practices defies credibility. These problems are only exacerbated at the earlier end of the period. If Style I’s content is religious, does its difference from earlier art mean that this religion only emerged c.475 and, if so, why? 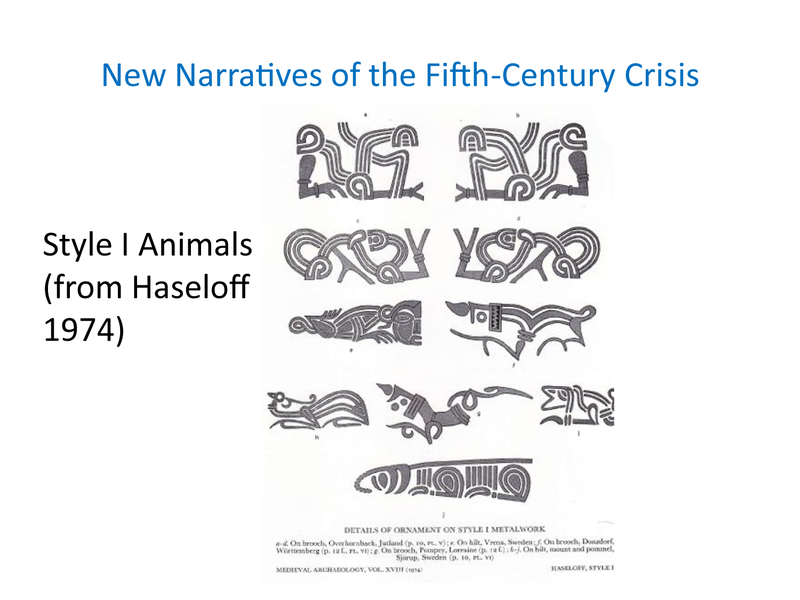 Or, if the religious beliefs were older, why did art not manifest it before the emergence of ‘Germanic animal art’, or why did it represent it in such different ways? These are the same problems as we encountered with the ‘Germanic’ construct, and they are equally fatal to the approach. The religious axis takes us nowhere – in answer to the questions of ‘why then’ and ‘why like that’ – just as quickly as the ‘Germanic’. The strongest argument offered in favour of the approach is the depiction on Style I metalwork of episodes identifiable, with varying degrees of plausibility, as those mentioned in the Eddas. There are two problems with this justification. A fourth-century depiction of Christ at, say, the marriage at Cana might be recognisable as such to a twelfth- or thirteenth-century western European Christian. We would quite wrong, however, to assume on that basis that Christian theology, practice and organisation from 1300 could be applied in any detail at all to the church of c.400, or even of c.900 and its artwork. In that instance, moreover, a series of more or less canonical written texts existed, around which beliefs could be anchored to some extent. It is worth pointing out, furthermore, that the earliest runic texts actually to mention the gods of the Nordic pantheon come from slightly later than the period of Style I and frequently from areas far to the south, in ‘Alamannic’ regions. One inadmissible justification for the use of later Eddic evidence is the assertion that structures would remain intact within traditions even if the details changed. It is difficult to see what the basis for such a statement could be and, in any case, the ‘structures’ adduced are modern interpretations, rather than being explicitly described in the texts. At the weakest end of the scale is the simple acceptance of the method, ‘faute de mieux’. Tania Dickinson, one of the most careful and knowledgeable of Anglo-Saxon archaeologists, simply says that most schools of archaeological ‘theory’ accept the approach. That will not suffice to exclude critical reflection on the issue. These analytical axes are sustained, first by a raft of similarly evidence-free, mystifying ideas about the magic quality of the artefacts and then by ideas of ethnicity, migration and of a rigid Christian-pagan divide which are all inadequate to the task. This means that, even if one could assume that the religious ‘texts’ of the Eddas (written or otherwise) had been transmitted, unchanged, for 700 years before being written down, we would be in no sense authorised to assume an unchanging accompanying theology. The most alarming element of what we might call the Nordic/Germanic Pagan’ school of writing about Style I is that it seems, intellectually, to be entirely hermetically sealed; discussion appears to be locked within a particular academic circle. The sorts of questionable readings just discussed are repeatedly built upon, adding further assumptions and interpretations, which then in turn become building blocks for further work and so on, producing pyramids of dubious assertions. With so much now at stake, in terms of academic status and power, there seems no way that a fundamental, scholarly critique of the approach can emerge from within this paradigm.